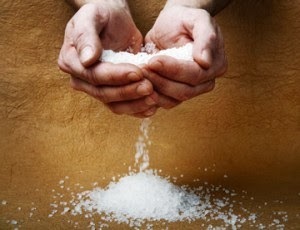 · Hair: Mixing a handful of Epsom salts into shampoo absorbs excess oil, allowing hair to appear fuller and feel softer. The minerals in the solution help to repair and strengthen split ends from over-styling and damage caused by heat. · Face: Skip the professional facial and take part in a do-it-yourself treatment by combining pinch of Epsom salts with everyday cleanser. Gently massage onto skin and rinse with cool water. The result is a refreshed, rejuvenated glow. · Body: Epsom salts can help reduce the appearance of bruises and spider veins with a simple compress. Start by soaking an old t-shirt, or a cotton cloth, in cold water and a handful of Epsom salts and apply directly to skin. If cellulite is more of an issue, rub some salts on the problem area; the magnesium in Epsom salts helps draw excess toxins and fluid out of the skin, leaving behind a softer, smoother surface. · Feet: After a long day standing or wearing uncomfortable shoes, prepare a foot soak of warm water and a handful of Epsom salts to help soothe aches and pains, as well as combat odor. The anti-inflammatory properties help reduce swelling and puffiness and the granular texture helps to soften the porous skin on the heels making it easier to remove with a pumice stone or foot file. For those of you suffering from sleep problems due to stress, hormonal changes or insomnia, soaking in a hot bath with Epsom salts before bedtime helps you unwind and relax so you can sleep better. Add a little lavender essential oil to the bath for added relaxation. Whether you’re prone to a sensitive stomach or have indulged in a rich meal, soaking in a warm bath with Epsom salts helps reduce water retention by drawing out toxins and excess fluids through the skin. If you’re looking for a quick, safe internal detox, a teaspoon of food grade Epsom salts in room temperature water has a gentle laxative effect that helps to ease a cranky digestive system and occasional constipation.